Description: This plant is a summer annual; it is either introduced or native and somewhat variable in appearance. Depending on the fertility of the soil, this plant is 1-6' tall, branching occasionally. Large mature specimens have a bushy appearance, tapering gradually toward the apex. 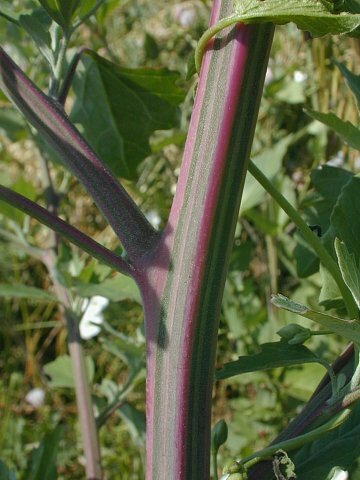 The stems are stout, angular, and variably colored, ranging from light blue-green to striped with purple and green. Young stems are covered with a fine mealy pubescence, while older stems become more glabrous. The alternate leaves are up to 5" long and 3" across (excluding the petioles). The older lower leaves are broadly lanceolate or ovate with irregular margins. These margins are undulate, slightly lobed, and/or dentate, and they are sometimes reddish purple along the edge. The dentate teeth are large, widely spaced, and blunt. The upper surface of the lower leaves is usually green or bluish green and glabrous, while the lower surface may be glabrous to more or less white mealy with tiny white hairs. The petioles are slender and long, often at least half the length of the leaves. The upper leaves have a similar appearance to the lower leaves, except that they are smaller, more narrow, and more white mealy from the presence of tiny white hairs, which are present on both the lower and upper surfaces. The major upper stems and some of the side stems terminate in panicles of flowering spikes. On large plants, the individual spikes of this inflorescence may be up to 8" long, but they are usually less than half this size. The inconspicuous yellowish green flowers are sessile against the flowering stalks and densely distributed. Each flower is about 1/10" (2.5 mm.) across, consisting of a green calyx with 5 acute lobes, no petals, 5 stamens with yellow anthers, and a short style that is cleft into 2 or 3 parts toward its apex. The calyx is conspicuously white mealy across the outer surface, and its lobes are slightly keeled. The blooming period can occur from mid-summer through the fall, and lasts about 1-2 months for a colony of plants. The flowers are wind-pollinated. The ovary of each flower matures into a single horizontal seed that is black, flattened, and nearly round. The lobes of the calyx curl inward and wrap around this seed, more or less obscuring it from view, except for a tiny opening at the top. This seed has a gray membranous covering that is difficult to remove. A single plant can produce 50,000 or more seeds. The root system consists of a taproot that is short and stout. This plant spreads by reseeding itself, sometimes forming sizable colonies. Cultivation: Full sunlight, mesic moisture levels, and a fertile loamy soil are the preferred conditions for growth and development. Partial sun and less fertile kinds of soil are also tolerated. This plant can become aggressive because it can produce abundant seedlings that cover the ground. The seeds can be remain viable in the soil for 40 years. The best method of control involves destroying the plants before they can form seeds. Range & Habitat: Lamb's Quarters is a common plant that occurs in every county of Illinois (see Distribution Map). Most authorities consider this species to be an introduction from Eurasia, but others believe that there are native strains. Habitats include cropland, old fields, gardens, nursery plots, vacant lots, weedy meadows, construction sites, and miscellaneous waste areas, particularly where the soil has been recently disturbed. 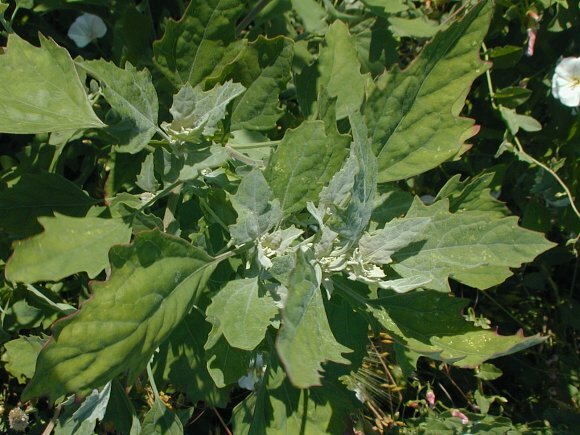 Lamb's Quarters does not invade high quality natural areas to any significant extent. Faunal Associations: Because the flowers are wind-pollinated, they are visited by few insects. The leaves of Lamb's Quarters are eaten by the caterpillars of two skippers, Staphylus hayhurstii (Hayhurst's Scallopwing) and Pholisora catullus (Common Sootywing), as well as the caterpillars of such moths as Grammia virgo (Virgin Tiger Moth), Emmelina monodactyla (Morning Glory Plume Moth), Amyna octo (The Eight-Spot), Chrysoesthia lingulacella (Flamboyent Twirler Moth), and Scythris limbella (Chenopodium Scythris Moth); see Opler & Krizek (1984), Covell (1984/2005), Needham et al. (1928), and Marshall (2006). Other insect feeders include the seed-eating Harpalus pensylvanicus (Pennsylvania Ground Beetle), Disonycha triangularis (Three-spotted Flea Beetle), maggots of Pegomya hyoscyami (Spinach Leafminer), Hayhurstia atriplicis (Chenopodium Aphid), Norvellina chenopodii (Chenopodium Leafhopper), Orthotylus flavosparsus (a plant bug), Proxys punctulatus (Black Stink Bug), the seed-eating Gryllus pennsylvanicus (Fall Field Cricket), and several grasshoppers; see Lundgren & Rosentrater (2007), Clark et al. (2004), Needham et al. (1928), Robinson & Bradley (1965), DeLong (1948), Knight (1941), Rider (2009), and Joern (1985). The foliage of Lamb's Quarters is palatable to domesticated livestock (including pigs and sheep) and deer. The seeds of Lamb's Quarters are able to pass through the digestive tract of the White-tailed Deer and remain viable, by which means this plant is spread to new areas (Myers et al., 2004). The seeds of this plant are eaten by the Deer Mouse and House Mouse (Whitaker, 1966; Houtcooper, 1978). Many granivorous songbirds also eat the seeds, especially sparrows (see Bird Table). Both the foliage and seeds are also palatable to humans. Photographic Location: A disturbed area of the Windsor Road Prairie in Champaign, Illinois. 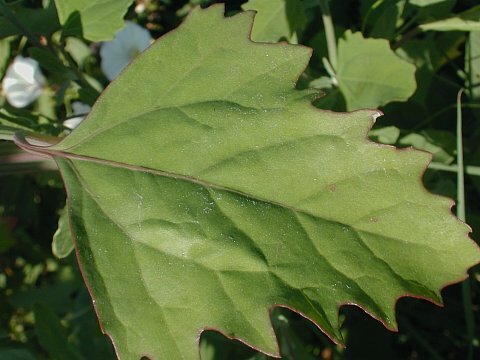 Comments: Lamb's Quarters is often dismissed as a mere weed, but it is an important source of food and cover to many kinds of insects and birds. The young leaves and stems can be added to salads (the taste is rather bland and dull), or they can be boiled as a potherb. Some tribes of Amerindians reportedly ground the seeds into flour. Lamb's Quarters has been the subject of taxonomic disputes among botanists. Some authorities consider Lamb's Quarters to be a variable species with numerous varieties, while others view these varieties as separate species. To correctly identify a Chenopodium sp. (Goosefoot), several features should be taken into consideration. Lamb's Quarters has: 1) horizontal seeds (relative to the position of the flowers), 2) foliage that is mealy white while young, 3) a calyx with a mealy appearance that nearly encloses the seed, 4) a membranous seed covering that is difficult to remove, and 5) rather broad leaves with margins that are undulate, slightly lobed, or dentate, rather than smooth. These five features, when they are taken together, distinguish Lamb's Quarters from most Goosefoot species. Plants with largely glabrous leaves on the undersides are often classified as Chenopodium album missouriense (Missouri Lamb's Quarters), while the typical variety has leaves with white mealy undersides. Mohlenbrock (2001) considers Missouri Lamb's Quarters to be a separate species, Chenopodium missouriense.